In response to the efforts of the Pascagoula, Mississippi City Council to use zoning laws to evict residents from their FEMA trailers, the Lawyers' Committee for Civil Rights Under Law and the Mississippi Center for Justice have filed suit to preserve this housing for hundreds of FEMA trailer residents. On Friday, May 25, 2017, the Mississippi Center for Justice filed a bill of exceptions in the Circuit Court of Jackson County on behalf of nine residents in three trailer parks, challenging the City Council's zoning decision to terminate residents' rights to live in their trailer parks. Kim M. Keenan honored on May 16 as Women Lawyer of the Year by the Women's Bar Association of the District of Columbia during 90th Annual WBA/WBAF Awards Dinner. (New York, NY) - On Monday, May 21st, the Lawyers' Committee for Civil Rights Under Law (Lawyers' Committee) will honor Aetna, Inc. and the Colgate-Palmolive Company for their commitment to diversity with the prestigious A. Leon Higginbotham Corporate Leadership Award. Bridgeport, CTApril 28, 2017, the Lawyers Committee, in partnership with the NAACP Connecticut State Conference, Connecticut Appleseed, and Connecticut for Achievement Now (ConnCAN), kicked off a series of four workshops throughout the state to train parents to advocate for quality education and increase their involvement in closing achievement gaps in Connecticut schools. Washington, D.C.  On March 27, 2017, the Lawyers' Committee for Civil Rights Under Law filed a brief in the Supreme Court case BCI Coca Cola Bottling Co. of Los Angeles v. EEOC to vindicate the rights of an African American employee who was discriminatorily terminated. Eight prominent civil rights groups joined the brief, which asserts that employers must be held accountable whenever race motivates the termination of an employee. The Supreme Court will hear oral argument in the case on April 18, 2017. Washington, D.C.  On March 26, 2017, the Lawyers' Committee for Civil Rights Under Law filed a brief in Dukes v. Wal-Mart, urging the Ninth Circuit Court of Appeals to let stand a previous decision certifying a class of 1.6 million Wal-Mart employees. The plaintiffs allege discrimination in pay, recruitment, and promotions. The brief contends that no employer is so large as to escape justice for discrimination in the workplace. Eight other civil rights groups joined the brief. 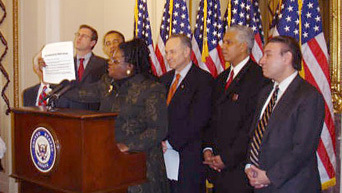 Washington, D.C. - The Lawyers' Committee for Civil Rights Under Law applauds the reintroduction of the Count Every Vote Act of 2017 and commends Senator Hillary Clinton, Representative Stephanie Tubbs Jones and all of the bill's co-sponsors for their dedication to ensuring that all eligible Americans have an equal opportunity to exercise the fundamental right to vote. In a recently released bi-partisan report titled, Beyond NCLB: Fulfilling the Promise to Our Nations Children, the Commission on No Child Left Behind notes the Lawyers Committees intervention in the case Connecticut v. Spellings. The Aspen Institute, an international non-profit organization, initiated this independent Commission of fifteen education experts to draft recommendations designed to serve as a blueprint for the anticipated 2017 reauthorization of the No Child Left Behind Act. To review the Commissions report, click here. The Maryland Election Protection Coalition released a report on the problems experienced by Maryland voters during the November 2006 statewide election cycle. The report is based on hundreds of complaints from Maryland voters received by Election Protection, the nations largest non-partisan voter protection coalition, which operates a national hotline on and before Election Day to guide voters through the voting process. The report was drafted by the Lawyers' Committee for Civil Rights, with valued assistance from the NAACP, People for the American Way Foundation, ACLU of Maryland, the Maryland Disability Law Center, the League of Women Voters of Maryland, and the many other members of the Maryland Election Protection Coalition. WASHINGTON, DC - Today, the Lawyers' Committee for Civil Rights announces their support for the Deceptive Practices and Voter Intimidation Prevention Act of 2017, and applauds the efforts of Senators Barack Obama and Chuck Schumer who introduced the bill. For NY Times article, click here. (Gulfport, MS) - On Saturday, January 27, the first environmentally-friendly modular home in the historic African American community of North Gulfport, Mississippi will be unveiled at a ribbon-cutting ceremony from 2:00 p.m. - 5:00 p.m. This special ceremony will occur at 8208 Ohio Street and will be followed by a tour of the model home and a block party. The event will showcase one of the most innovative solutions yet proposed to the housing crisis gripping the Gulf Coast after Hurricane Katrina. On Monday, December 11, the Lawyers' Committee released its Election Protection report to the Board of Directors and Trustees, Staff, and Pro Bono Partners, discussing Election Protection's legal program and election problems encountered in states across the country. (New York, NY) - The Lawyers' Committee for Civil Rights Under Law (Lawyers' Committee) will hold its 2006 Annual Awards Reception to honor the outstanding work and tireless dedication of the lawyers, law firms, and clients who work with the Lawyers' Committee on critical civil rights matters. NEW ORLEANS, La. - Today, fair housing advocates, joined by a local property owner, announced an agreement with St. Bernard Parish to suspend enforcement of a September ordinance barring single-family homeowners from renting to anyone except blood relatives without the special permission of the Parish Council. The Parish agreed to the order the advocates requested after they filed a motion last week asking the federal district court in New Orleans to block the law. (Washington, DC) - The Election Protection Coalition reported over 20,000 calls on Monday and Tuesday to its voter assistance hotline 1-866-OUR-VOTE. The greatest number of calls to the hotline came from Ohio, Georgia, California, Pennsylvania, Florida, and Maryland. (Ashland, Alabama) - Tyson Foods, Inc. (NYSE: TSN) and a group of current and former workers have reached a settlement in a discrimination lawsuit involving the company's Ashland, Alabama, poultry plant. WASHINGTON-The nonpartisan Election Protection coalition, led by the Lawyers' Committee for Civil Rights Under Law, People For the American Way Foundation and the NAACP, plans to hold up to three briefings for reporters on Election Day to update them about potential election problems around the nation. St. Bernard Parish, La.  The Lawyers Committee for Civil Rights Under Law and the law firm Relman and Associates filed a preliminary injunction today to suspend a discriminatory ordinance barring single-family homeowners from renting to anyone except blood relatives without the special permission of the Parish Council. Also filed today was an amended complaint, which along with the preliminary injunction, alleges that the ordinance, both in intent and effect, disproportionately excludes minority families seeking housing and perpetuates the parishs history as a segregated, predominantly white community. The filings explain that because whites own virtually all single-family homes in the parish (93% according to 2000 census data), the blood relative ordinance effectively limits rentals to whites only despite the disproportionate need by minorities for rental housing. Also harmed are the homeowners who would otherwise be able to rent out their homes. For a copy of the Amended Complaint, click here. For a copy of the Motion for Preliminary Injunction, click here. As the November elections approach, the nonpartisan Election Protection coalition is launching its national 1-866-OUR VOTE voter assistance hotline and the poll location web site www.MyPollingPlace.com. 1-866-OUR-VOTE is the only national voter assistance hotline staffed by live call center operators trained to provide state specific assistance to all voters. Lawyers, poll monitors and additional volunteers will be mobilized in 16 key states across the nation to assist voters in the days leading up to the election and on Election Day. Led by People For the American Way Foundation, the NAACP, and the Lawyers' Committee For Civil Rights Under Law, Election Protection (EP) has operated in every election cycle since 2001, and is the nation's most far-reaching nonpartisan effort to provide voter assistance and protect voter rights. The services will include bilingual assistance for areas with a heavy concentration of Spanish-speaking voters. WASHINGTON, DC - In order to defend the voting rights of millions of minority citizens, the NAACP, the Lawyers' Committee for Civil Rights, and the law firm of Wilmer Cutler Pickering Hale & Dorr LLP have requested that a federal court allow the NAACP to intervene in a challenge to the constitutionality of Section 5 of the Voting Rights Act (VRA). On October 14, 2006, the National Commission on Environmental Justice on the Gulf Coast convenes it first hearing in Gulfport, Mississippi. The Commission is a panel of prominent academics, local community leaders and civil rights practitioners charged with creating a comprehensive report detailing the history of environmental justice issues unique to the Gulf and in the wake of Hurricanes Katrina and Rita. Too often, politically and economically powerless residents bear the disproportionate burden of environmental hazards. WASHINGTON - The Ninth Circuit Court of Appeals issued an order today that will enjoin the State of Arizona from implementing Proposition 200's voter ID requirements in connection with next month's November 7th elections. ST. BERNARD PARISH, LA - An ordinance barring single-family homeowners from renting to anyone except blood relatives discriminates against African Americans and Hispanics, according to a lawsuit filed today by the Greater New Orleans Fair Housing Action Center (GNOFHAC) and the Lawyers' Committee for Civil Rights Under Law. In St. Bernard Parish, an overwhelmingly white area where over 93% of all such homes are owned by whites, this will disproportionately exclude minorities and perpetuate the parish's history of segregation. You may have heard that some public housing in the Gulf Coast will be sold or closed. To reduce fear, confusion and misinformation, these materials explain what we know about MRHA VIIIs plan and what the decision means for you. On Thursday, August 17, 2006, the Mississippi Regional Housing Authority for Region VIII (MRHA VIII) voted to submit an application to the United States Department of Housing and Urban Development (HUD) to dispose of public housing units at Charles Warner Homes in Pascagoula and the L.C. Jones Homes and W.M. Ladnier Homes in Gulfport. Click here to learn about your rights. (Providence, RI) - Today, the NAACP, Providence Branch filed a discrimination complaint with the federal Equal Employment Opportunity Commission (EEOC) against the city of Cranston, Rhode Island, for the city's failure to hire minority and female firefighters and police officers. WASHINGTON - The Lawyers' Committee for Civil Rights Under Law is extremely troubled by today's vote of 228-196 in the House of Representatives in support of the so-called Federal Election Integrity Act of 2006, HR 4844. Contrary to its title, the bill will undermine the integrity of our election process by imposing unnecessary barriers to full participating in federal elections. August 29, 2006: CLEVELAND  Today, the American Civil Liberties Union of Ohio along with the Lawyers Committee for Civil Rights Under Law, the Brennan Center, and the ACLU Voting Rights Project filed suit in Federal Court for the Northern District of Ohio challenging a section of Ohio House Bill 3. (Gulfport, MS) - One year later, the majority of Gulf Coast hurricane survivors are still mired in bureaucratic roadblocks to recovery. The storm's latest victims are public housing residents who face displacement from the apartments that survived Katrina. Marsha E. Simms, a partner in Weil Gotshals Banking & Finance practice, was elected Co-Chair of the Board of Directors of the Lawyers Committee for Civil Rights Under Law (Lawyers Committee). Her term of office will begin in September 2006. Ms. Simms will serve as Co-Chair with Robert E. Harrington, a shareholder of Robinson, Bradshaw & Hinson in Charlotte, North Carolina. Ms. Simms position was previously held by Marjorie Press Lindblom, a partner with the New York office of Kirkland & Ellis. Lawyers' Committee sues Tyson Foods, Inc. for a racially hostile work environment. Lawyers Committee lawyers have made a short documentary, The New Homeless, to bring to the public images of the persistent Katrina housing crisis and to advocate for a rebuilding effort that protects the rights of all segments of society. The video explains the housing challenges faced by low-income and minority Katrina survivors on the Gulf Coast of Mississippi, and suggests legal and policy solutions to the crisis. (Washington, DC) - The Lawyers' Committee for Civil Rights is pleased that U.S. District Judge Stanwood R. Duval, Jr. issued an opinion on June 16, 2006 that affirms the 5th Amendment Due Process right of hurricane survivors to sue FEMA for its failure to provide temporary housing assistance guaranteed by the Stafford Act and Declaration of Emergency by the President of the United States. In this order, although denying some and upholding other of plaintiffs' claims, Judge Duval expounded on an extensive criticism of FEMAs inefficiency and lack of action to provide disaster relief to citizens most vulnerable from Hurricane Katrina. In addition, Judge Duval issued a subsequent order on June 30, 2006, granting the plaintiffs class certification. Hence, the McWaters plaintiffs represent all Katrina survivors who applied for assistance or participated in FEMAs Short-Term Lodging program after Hurricane Katrina destroyed their pre-disaster primary residences in Federal Disaster Areas of Louisiana, Mississippi, or Alabama; as well as those FEMA erroneously required to complete a SBA loan application to receive emergency assistance. Fortunately, FEMA voluntarily agreed to change many of the complained of practices. The Lawyers Committee is urging the United States House of Representatives to reject H.R. 4844, the so-called Federal Election Integrity Act of 2006, introduced by Representative Henry Hyde (IL). Contrary to its title, Representative Hydes bill is undemocratic, unfair, and unconstitutional, needlessly requiring proof of citizenship when eligible voters register to vote and photo identification when citizens cast a ballot. To read the Lawyers Committees letter to the House Committee on Administration opposing H.R. 4844, click here. WASHINGTON, DC  The Lawyers Committee for Civil Rights Under Law has joined other civil rights organizations in the widespread call for comprehensive and humanitarian immigration reform that addresses the major flaws present in the current immigration system. HARTFORD, CT-- The Lawyers Committee is pleased to announce that on September 27, 2006 the US District Court of Connecticut ruled that the State of Connecticuts lawsuit against Margaret Spellings and NCLB was outside of its jurisdiction. Therefore, the State cannot sue in federal court claiming NCLB is an unfunded mandate. In January 2006, the Lawyers Committee sought to intervene on behalf its clients the NAACP in the States lawsuit (CT vs. Spellings), contending it threatens minority and poor schoolchildren. FEMA Ordered to Extend Evacuee Hotel Stay to Feb 7th. Click here to view the December 12, 2005 Court Order. Lawyers' Committee welcomes Judge James Carrs order denying Defendants motion to dismiss in League of Women Voters of Ohio v. Blackwell. The Lawyers' Committee, together with our co-counsel, brought this historic case on behalf of the League to remedy the systemic deficiencies in Ohios election administration. Click here to read Judge Carr's decision.